Many homes and offices now have capsule/pod coffee machines and most of us throw the used capsules straight into the general waste (to end up in landfill). 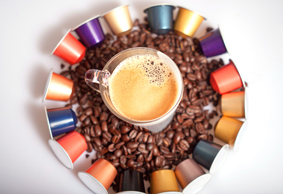 But did you know that some coffee capsules are now recyclable? Simply collect the used capsules (bags and recycling canisters can be purchased from Nespresso) and take them in to one of the collection points near you. From here the capsules are taken to a recycling facility where the aluminium is separated from the coffee grounds. The coffee grounds are used as natural fertilisers while the aluminium is compressed into blocks and smeltered into new aluminium products. It’s perhaps more surprising that cigarette waste can actually be recycled! A relatively new scheme to Australia is the ‘Cigarette Waste Brigade’ through a global organisation called TerraCycle. Interested parties collect cigarette waste (includes all parts of extinguished cigarettes, filters, rolling papers and ash), package it up and post it free of charge to TerraCycle. The waste collected through the ‘Cigarette Waste Brigade’ will be recycled into a variety of useful products such as park benches and rubbish bins. The programme can be followed at home, the office, restaurant or other business establishment. There may be more items throughout your workplace or home that you are throwing straight into landfill that are actually recyclable. For more information or for any questions you may have on how you can recycle unlikely items please contact us. Recycling at home made easy!